I did not like “The Revenant” much at all, but I find myself agreeing with some of the film's boosters. The film's alleged “thin plot” is a virtue, not a vice, and the same is true of its alleged lack of characterization. Its shortcomings lie elsewhere. As supporters note, director/writer Alejandro G. Inarritu and co-screenwriter Mark L. Smith strive for a brand of “pure cinema,” a film that immerses the viewer fully in a palpable experience, all cold winds swirling and treacherous mud grabbing at your tattered boots, and the stripped-down treatment of narrative and character are essential to that pursuit. 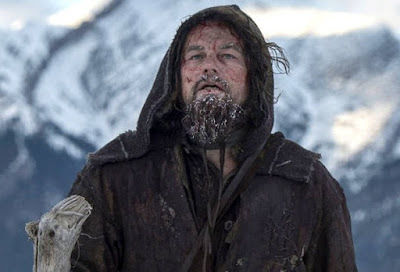 Nineteenth century frontier scout Hugh Glass (Leonardo DiCaprio) is almost killed by a bear, abandoned to die in the snowy woods by the duplicitous fur trader Fitzgerald (Tom Hardy), and rises from his makeshift grave to seek revenge. Intricate subplots and so-called character development would only provide a distraction from this simplest of goal-oriented premises. Indeed, the script's most questionable aspect is the addition (from the novel by Michael Punke on which the film is “based in part”) of Glass's half-Pawnee son Hawk (Forrest Goodluck), intended to flesh out Glass and provide audiences a hook to sympathize with the protagonist. Because apparently they wouldn't care about him almost being killed by a bear and then buried alive by a lowdown dirty coward. The content is just fine, it's the style that undermines the quest for pure experience. An early battle sequence in which Native Americans attack a group of mud-crusted, ragtag fur traders is quite an attention-grabber. Cinematographer Emmanuel Lubezki and his crew send the camera pirouetting through the muck in a lengthy unbroken shot in which dozens of flawlessly choreographed bodies stumble into frame just in time to be stabbed, shot down by arrows, or to grapple futilely with the next foe who rotates into the shot at just the right time. It's the first of several impressive stunts, including a harrowing escape on horseback that ends with a cliff dive into the abyss, so intricately staged it's... Did I mention flawless? How about perfect? Immaculate? And therein lies part of the problem. In interviews, Inarritu has spoken at length about the arduous shooting on remote locations in Alberta, Canada and in southern Argentina, playing up the logistical difficulties in an effort to situate his film alongside famously gonzo productions like Werner Herzog's “Fitzcarraldo” (1982) and Francis Ford Coppola's “Apocalypse Now” (1979). Inarritu's cast and crew have every reason to be proud of their battle with the elements; the problem is that they won the battle so decisively. Where “Fitzcarraldo” functions as a documentary of its own daredevil making, constantly threatening to collapse under the weight of its reckless lunacy, “The Revenant” bears witness to a production team that tamed the wilderness, that bent nature's fury to the needs of a carefully controlled shoot that prizes polish and precision over chaos. Can a scene that takes months to block out and rehearse really engender the sense of feral immediacy Inarritu is after? I guess the answer is that it could, but here it just feels blocked out and rehearsed. The film is often muddy, but never messy. The cartoon bear doesn't help. One of the many drawbacks to increasingly photorealistic CGI is that filmmakers feel the need (or perhaps the market-driven obligation) to fully showcase their digital critters. No need to oblique or suggestive (i.e. creative) when you've got such awesome FX; you just go full ursine, baby. In the film's pivotal attack, the bear lumbers through the snow with her cubs, stomps poor Hugh Glass into the muck, thrashes him about repeatedly, then wanders off and returns for seconds, its very realistic fur rippling and saliva dripping from its big ol' cartoon bear tongue as it mashes its big ol' cartoon bear claws right on top of Leo's crunchable skull. It is yet another impeccably choreographed sequence which might make the viewer ask “Wow, how'd they do that?” but does precisely nothing to pull the viewer into the world, to immerse one in the experience of the moment. In a recent “Film Comment” interview, Inarittu notes how important it is for this scene to look like a documentary, to make you feel that “You are there. You are being attacked.” This groovy video game cutscene misses that mark by a mile. The cartoon bear isn't a deal-breaker, but merely another symptom of the underlying weakness. The self-conscious, stunt-oriented shooting style and the handful of heavy CGI scenes (a digital bison herd is another groaner) contribute to the weightless feel of “The Revenant.” Even as a very game and committed DiCaprio grunts and drags his broken body through the blood-stained snow, the film lacks anything resembling a visceral quality – you can all but hear “OK, Leo, action!” at the start of some shots. The much-publicized struggles on hostile locations have produced a film that, aside from some gorgeous nature panoramas, feels for all the world like it could have been shot in a studio. Calling it phony might be unfair, but authentic it sure ain't.